The purpose of this consultancy is to develop a regional framework for Case Management Information Management (CMIM) for children - including children on the move - building on existing initiatives, guidance, tools and efforts at the national level. Understanding that each country (Ethiopia, Somalia, Sudan) in this phase of the COTM programme is at a different stage in the development of their national programmes, the consultant will lead a process to determine the status, assess the needs, gaps, capacities, strengths and opportunities in country-level case management information management systems. He/she will work with country, regional and global level teams to develop a strategy for CMIM for COTM, propose it for endorsement, and create a workplan for regional and country-specific priority actions. UNICEF is mandated to respond to the needs of all children, including children in emergency situations, and to assist government counterparts in implementing a wide range of child protection programmes. These programmes depend on the timely, accurate collection of data and its secure and efficient management, storage and use. UNICEF’s Child Protection objectives are to actively prevent children from being harmed and to support programmes to respond to instances where children are at risk of or have been subjected to violence, exploitation or abuse. The quality of case management can be reinforced by improving digital systems, such as information management systems that support the social services workforce. Such systems can improve efficiency and accountability and provide rich data to inform policy and programmes, making compiled data actionable and useful. Understanding a child’s needs requires time and skill. Social workers must be able to build rapport and trust with vulnerable children and to assess their needs. Much of the process depends on children’s willingness to seek out services, as well as the availability of the services themselves. If children are afraid of accessing services or are subjected to processes that discourage them from seeking help, the likelihood that they will receive support decreases dramatically. Such situations are further complicated when children are on the move, as traditional fixed-location means of identification and engagement are often not effective. Whenever possible, children should be able to access services in a way that does not require them to be repeatedly registered or subjected to questioning. Gaps currently exist in coordination at the national level among child protection actors and law enforcement authorities that come into contact with unaccompanied migrant children or children in families. Referral mechanisms incorporating both formal and informal actors (where they exist) require additional capacity and resources to enhance their reach and efficacy in providing appropriate services. Additional complicating factors include the need to protect children’s data while ensuring continuity of care, and facilitating cooperation among service providers transnationally. A pragmatic approach requires that national case management systems include functionalities that promote interoperability domestically and transnationally, to ensure a continuum of care for children as they migrate. This entails assessing case management systems in the target countries, analyzing datasets, mapping relevant actors, identifying the competent authority, and developing a roadmap towards digitalization centered around a case management system that reinforces existing principles and standards. 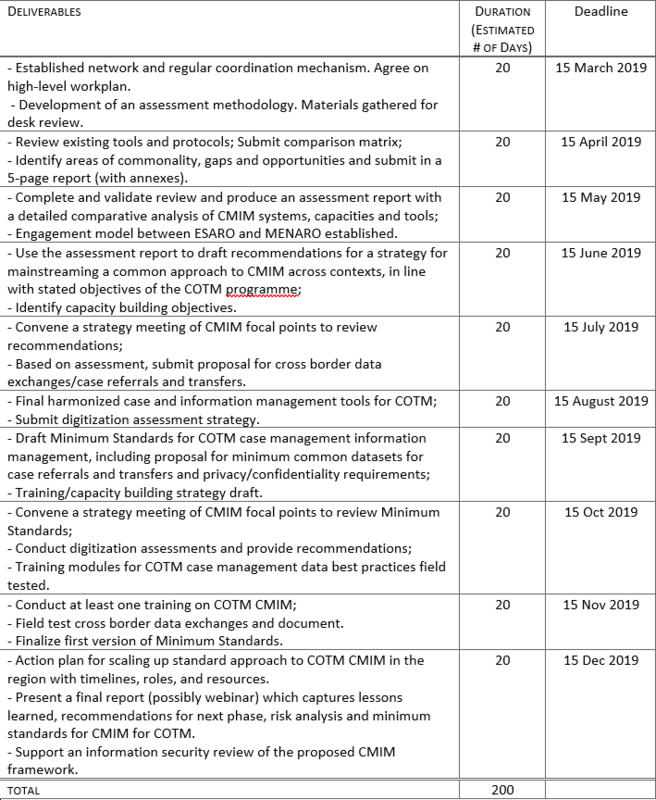 The purpose of this consultancy is to develop a regional framework for Case Management Information Management (CMIM) for children - including children on the move - building on existing initiatives, guidance, tools and efforts at the national level. Understanding that each country (Ethiopia, Somalia, Sudan) in this phase of the COTM programme is at a different stage in the development of their national programmes, the consultant will lead a process to determine the status, assess the needs, gaps, capacities, strengths and opportunities in country-level case management information management systems. He/she will work with country, regional and global level teams to develop a strategy for CMIM for COTM, propose it for endorsement, and create a workplan for regional and country-specific priority actions. Based on the assessment and existing good practices, the consultant will lead on the development of an approach to improve information management practices for COTM, both paper-based and digital, including developing minimum quality standards, standard operating procedures (SOP), simplified forms, supervision guidance, information sharing protocols, revised consent processes, form harmonization, tool development (including for mobile devices), referral/transfers protocols for COTM. Act as the CMIM focal point for ESARO, and coordinate relevant work with other regional offices. Support dialogue - in close coordination with UNICEF ESARO and HQ - with UNICEF staff and partners about cross border information sharing, and will develop a proposal for how this type of data can securely and effectively be shared. This may include discussions on interoperability between data systems. Report on progress to donors as required. Duty Station : The consultant may be based in UNICEF ESARO offices in Nairobi, Kenya or work remotely with up to 25% (50 days) travel.